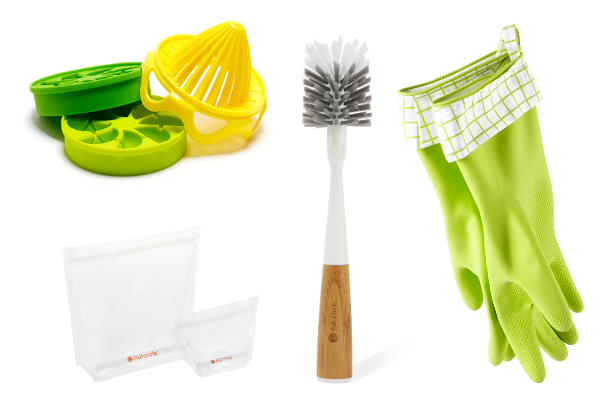 With a focus on sustainability, style, and functionality, Full Circle's innovative products help keep your kitchen and home beautiful, earth friendly, and inviting. Obsessed with transforming the products we use everyday, Full Circle's intentionally-designed tools let you live a better, more responsible lifestyle. In this TryaBox, you'll experience several of Full Circle's fine products, including the fun Lemon Drops citrus ice infuser set/pack: created to ream the citrus of your choice straight into the reusable Lemon Drops™ ice tray and freeze, these vitamin-packed, flavorful drops add a zing to any beverage! You’ll also find Full Circle's stylish reusable storage solution, the handy Ziptuck reusable storage bag—made with sustainable materials, the bag can even be popped into the dishwasher, ready to go again (and again, and again). Tryazon will select 100 participants for this opportunity. Those chosen will receive the all-new TryaBox with a selection of Full Circle products for you to sample and review. Learn more about the products and party by clicking the tabs below! Through their team's collective backgrounds in industrial design, manufacturing and sales, Full Circle develops new ways of making products with a major impact in the cleaning industry. To start, they collaborated with local growers, manufacturers and distributors to refine the process from start to finish. The results are innovative, well designed, responsibly made tools that help keep your home beautiful. Full circle is proudly obsessed with detail and is determined to evolve the way everyday products are made. That’s why the four founders teamed up to create the first line of products that are as stylish as they are sensible, reducing unnecessary waste while elevating design. What started as a better way to think about products turned in to a new way of creating healthier options that inspire smarter choices. Sustainability is great, design is vital, functionality is essential, and at Full Circle, all three of these aspects are necessary in their products. Every material in Full Circle's product line is carefully selected for its durability, giving you more time before each one ends its lifecycle. They choose options that take less energy to produce and cut back on greenhouse gases and harmful chemicals, making them as conscientious as they are long lasting. BCORP Certified: Full circle is proud to be in a family of businesses committed to solving environmental and social problems. Their B Corp certification shows their commitment to being and creating the very best for our world. "We’re not necessarily clean freaks, but we are healthy people. We have a value system and methods that let us create a better way to clean, cook, shop and even live. We believe that a more responsible lifestyle benefits everyone and everything, from our neighbors and friends to the planet and resources. All we need is the right tools"
Use #TryaBox and #FullCircle to include your tweet on this page! TryaBox sampling begins at the beginning of June! Love this bottle brush. It gets down in my water bottles and gets them clean. The bristles are stiff enough to clean the bottle inside and out and not scratch the outside.